Here is a great instrument that was released by Gold Tone this past year. We love this new electric banjo for many reasons. It is supposed to be a lower cost version of the popular EBM and EBT models used by Mumford & Sons, amongst others. But this banjo is really no toy. The stacked humbucker mounted eliminates feedback problems and gives this banjo a great clean sound when plugged into your amplifier. It is perfect for the on-stage banjo player and for practicing at home as it has less volume than regular fully acoustic banjos, but still giving the real tone a banjo should deliver. The tailpiece is also great, as it may well accept either loop-end or ball-end strings. 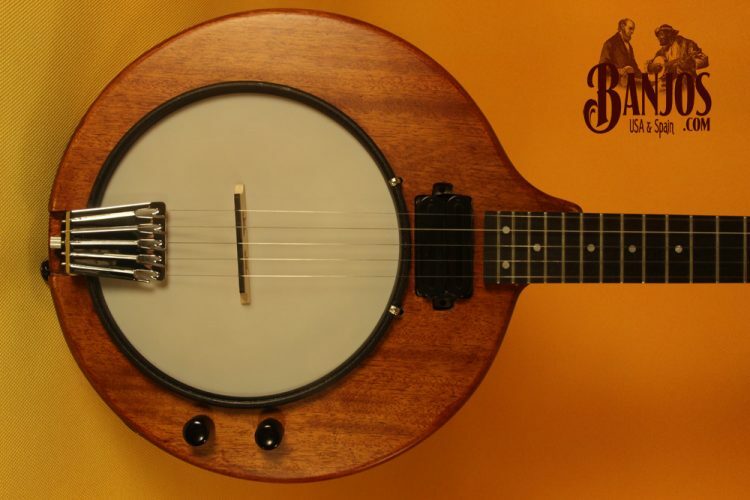 It is perfect for practicing any style of banjo (bluegrass, classic style, clawhammer…). It features a custom 8″ Remo head that needs no tensioning work inserted into a contoured solid mahogany body. Maple neck is smooth and perfect for chord changes with a satin finish that every quality banjo should have. A great addition to any banjo player´s arsenal.